PCAIAS can act as a Discretionary Fiduciary Advisor. A Fiduciary Advisor is an Independent discretionary consultant that accepts full fiduciary status and responsibility for decisions on the Plan’s investments. Investment Advisor becomes the primary fiduciary and therefore, is primarily responsible for the underlying investments. ERISA provides substantial protection or a “safe harbor” for Plan Sponsors using a 3(38) investment consultant; therefore, relieving the Plan Sponsor of the responsibility and potential liability. Plan Sponsors need ERISA Bonds to meet requirements for plan compliance as required by the Department of Labor and IRS. 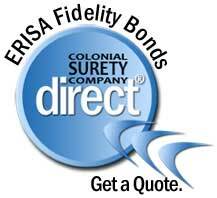 PCA has a strategic partnership with Colonial Surety to offer ERISA and Fiduciary bond services. Plan Sponsors recieve a 10% discount on bonding when using our partnership referral code. Please select the links to receive a quote and immediately secure your plan bonding.